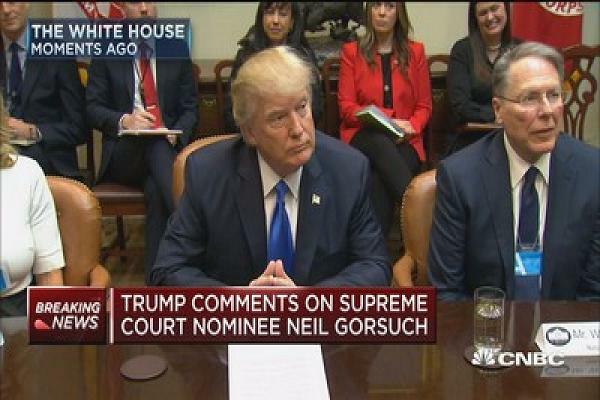 "President Donald Trump said Wednesday he will urge Senate Republicans to scrap filibuster rules, or take the “nuclear option,” if Democrats in the increasingly tense chamber use them to block his nomination of Neil Gorsuch to the Supreme Court. After Trump nominated the 49-year-old conservative appellate judge to the top U.S. court Tuesday night, Democrats signaled they could delay the process. If they filibuster, Republicans, who have 52 Senate seats, would need 60 votes to confirm him unless they change the rule on the maneuver. Trump told reporters at the White House he would encourage Senate Majority Leader Mitch McConnell, R-Ky., to take that route, which would require only a simple majority. “Yes, if we end up with the same gridlock that they’ve had in Washington, … if we end up with that gridlock, I’d say, ‘If you can, Mitch, go nuclear.’ Because that would be an absolute shame if a man of this quality was caught up in this web.”"